The T.M. Bancroft paint company's golf-infatuated owner has the business sense of squirrel trying to make up his mind which way to go in the middle of the road before getting hit by a car. Of course, he is smart enough to leave the running of his company to his assistant, A.B., although T.M. consistently takes the credit for A.B. 's astute business decisions. A.B., however, is a female who dresses in suits with ankle-length skirts and a tie. Her hair is cut like a man's, and her life revolves around the company, which means she has never had any kind of a relationship with a man, much less been kissed. She attends one of the company's board meetings at T.M. 's house, where she overhears T.M. 's grandson say some very disparaging things about her. Of course, he's never met her, but his anger results from A.B's firing of him from the Omaha office, sight unseen, via cable. Mrs. Bancroft loves her grandson, Jimmie, but she also feels sorry for A.B. because she overheard the harsh comments. She decides to teach A.B. how to be a women and starts by buying her new, very feminine clothes and re-doing her hair, plucking her eyebrows and adding some makeup. Then she teaches A.B. that men only want to hear two phrases: "Do go on," and "Aren't you wonderful!" When A.B. is debuted at the garden party, Jimmie automatically falls for her, not realizing she is the infamous A.B. The rest of the plot involves Jimmie trying to sell his invention, an egg-beater, to his grandfather, who refuses to have any part of it, A.B. secretly buying the egg-beater for $25,000, and then Jimmie being swindled out of the $25,000. Of course, A.B. has to come to the rescue, and all ends happily. OK, let's dismiss with the psychological mumbo-jumbo at the outset. "The Clinging Vine" is not a commentary on a gender identity crisis or women vs. men in the workplace or whatever. In fact, it's not a commentary at all - it's was meant purely for entertainment, nothing more. Reviewers of the time referred to it as a "satire," "trifling though fairly plausible entertainment," and "a farce-comedy." That's what it was intended to be, and that's all it is. Leatrice Joy was an attractive actress, but not considered one of the great beauties of the silent screen. This, coupled with the fact that a very short, mannish hairstyle was her trademark, must have been the reason she was chosen for this role. However, one should not underestimate her thespian talents - she was an accomplished actress when given the proper roles as evidenced by her superb work in such films as Cecil B. DeMille's "Manslaughter" (1922) and "Ace of Hearts" (1921) with Lon Chaney. "Too much stress o the masculine side"
When we are first introduced to her in "The Clinging Vine," she is working busily signing papers at a desk with several men around her -- documents, receipts, etc., being handed to her fast and furious. Her hair is cut very short in a masculine style with that Brylcreem shine. Her skin tone is dark and -- this is the part that has been so exaggerated it detracts from everything else -- her eyebrows are thick and long. If the intent was to make her unattractive, then they succeeded admirably. If the idea was to make her look like a man - they did that, too, but in a somewhat overstated fashion. Variety's (July 21, 1926) reviewer commented, "Rather pleasant entertainment that might have been a much better picture had there not been too much stress laid on the masculine side of the heroine early in the picture. An impression lingers as one views the picture that cannot be fought off, that a female impersonator is playing the girl. It persists in the mind as the picture unreels, despite one knows to the contrary." Anyone who is familiar with Leatrice Joy may find it difficult to understand how the reviewer was nagged by the feeling that this was a female impersonator playing the part of the girl, but the makers of this films -- and we probably would have to give the credit and/or blame to director Paul Sloane -- did such an overstated job of making her unattractive in the beginning that the reviewer does have a point -- it is rather difficult for us to see her in the beauteous light that was intended after Grandma worked her transformation on A.B. For example, her debut after the "makeover" comes when she walks out onto the porch leading to the lawn. At once, all the men come rushing up to her stunned by this gorgeous creature that has suddenly appeared. Of course, because this is our heroine, we are anxious to accept this caterpillar turned butterfly and see her charm the males -- but as much as we want it, the transformation still doesn't satisfy. But enough criticism. Yes, the critics of the time had less than laudatory words for the film, but it is good, light entertainment, has some inspired moments, and grabs the viewer's attention as we wonder how A.B. will save Jimmie from the dilemma he has gotten into. There is a scene in the film that does a fine job of eliciting sympathy from the viewer. A.B. has come downstairs to join the company officials and others who have gathered for the weekend at T.M. 's home when she overhears T.M. 's grandson, Jimmie. Complaining of the fact that he was fired -- long distance -- from the company's Omaha office by A.B., he tells his grandfather, "If you think I'm going to sit up and beg to any flat-chested, flat-heeled, flat-headed Amazon, you're wrong!" Joy's character doesn't react to this by breaking down and crying or by exaggerated lip-biting or throwing her arm across her face in tears. Instead, she reacts to this verbal assault by "fidgeting" with some papers in her hands and glancing nervously from side to side, obviously hurt and embarrassed. When Grandma gives her an apologetic look, Joy turns up one side of her mouth in a weak smile, then spins around and leaves. She makes this a very effective scene, and for the first time in the movie, we are shown a human, feeling A.B. rather than a hard-boiled businesswoman. The humor returns shortly, though, when Grandma tries to teach A.B. how to act around men. She explains that men only want to hear two things: "Do go on," and "Aren't you wonderful!" Grandma shows her how to wrap her hands across a man's shoulder, cling to him and look up and "twitter" her eyelashes while saying these essential phrases. The stiff and very proper butler is an extremely unwilling, but obedient -- and comical -- participant on whom A.B. practices at Grandma's urging. Of course, when Jimmie sees the new A.B. (he doesn't know who she is), he immediately falls for her. When she and Jimmie are in a lawn swing together, one of the silent screen's greatest character actors gets an opportunity to shine. 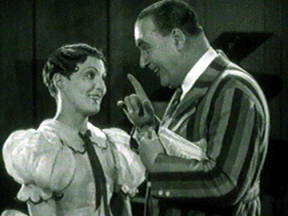 Snitz Edwards pops up unexpectedly in quite a few silent films that are available for viewing today, and his small stature, bulldog wrinkled face and smile that looks as if he's eaten something sour are always welcome. T.M. has sent Tutweiler (Edwards) to find A.B., but when he passes Jimmie and this very delicate, beautiful lady with him, he glances, but moves on. Then he stops -- something is very familiar about this woman. He stops and starts several times, each time turning his head like a quizzical pup, scratching his head and alternating grimaces with tight-mouthed looks of frustration. Finally, he works up enough nerve to say, "Pardon me, but aren't you A.B.?" Before she can respond, Jimmie jumps in with "For heaven's sake, Tut, go back to your tomb and leave this girl alone." By the way, the title writing, by the dependable John Krafft ("The Crackerjack," "The Live Wire," "Dress Parade," "White Gold," "The Yankee Clipper," "A Blonde for a Night"), is excellent. For example, Grandmas tells A.B., "Remember dear - a girl who tells a man all she knows doesn't know much," and adds later, "A man wants beauty, not brains. His task is to find a woman pretty enough to please him and dumb enough to love him." Dell Henderson's obnoxious swindler character tells Jimmie, "Money and women -- you gotta keep 'em busy or they lose interest." Earlier, when we get our first glimpse of the new and improved A.B., the title tells us, "Oh, what a magician was Grandma! She crossed a lemon with a dressmaker's bill and produced a peach." The story line, although not on a level with the most memorable films from this era, is interesting enough to hold our attention to the end. As mentioned there is some sentiment mixed in. A.B. is introduced to us as a ruthless businesswoman, firing employees by wire that she's never seen - a title tells us she has "hired, wired and fired men - but never kissed one." Later, we get an inkling of a softer side when she tells a newly engaged secretary, "I envy you -- you're going to be a happy wife instead of a sexless, loveless machine - like me." Brrrrrr! Pretty cold even to be saying about herself -- but Grandma comes to the rescue at just the right time -- immediately after we've seen A.B. 's feelings crushed by Jimmie's harsh words. The humor, albeit mild, is a plus for the viewer -- particularly during the scene when Grandma is trying to teach A.B. how to get a man. One instruction is to look up at the man longingly and "just twitter" -- Grandma's way of telling her to flutter her eyelids. Of course, this is totally out of character for A.B., and if anyone could be uncoordinated at "twittering," A.B. is! One tactic for holding our interest is the anonymity of A.B. Considering Jimmie's hatred of the businesswoman that has fired him sight unseen, A.B., of course, doesn't want him to know who she really is. One way she does this is by portraying herself as a "dumb Dora" (as one reviewer of the period described it) and saying little other than the two phrases Grandma taught her to repeat. She comes close to being betrayed when Tutweiler encounters A.B. and Jimmie on the lawn swing, but that's the only close call she has. A little more excitement could have been injected into the film had there been one or two other instances where her secret identity was in jeopardy. Also, how she plans to continue this ruse indefinitely, we don't know, but it is an engaging angle that keeps us wondering throughout the movie. Yes, the story does have some good points to recommend it, but probably more essential to the enjoyment of the story are the players. Leatrice Joy is always a joy (no pun intended) to watch, even when she's given less than stellar material. She's attractive, has personality on the screen and is a top-notch actress. Not to make too much out of a hair style, but one can't help but wonder if the "look" she chose for herself during the 1920's kept her from getting better roles in which she could have really shone? Robert Edeson as A.B's boss and owner of the company, T.M., is probably the biggest surprise in this movie. Variety said, "He slips over a character performance that few believed him capable of. It is a regular Theodore Roberts role, and he handles it perfectly." The cigar chewing, blustering, grouch with the gout - who also depends totally on A.B. for important business decisions and then takes credit for them all - is put over well by Edeson. And, yes, the role does "smack" of one of our most favorite silent movie character actors, Theodore Roberts (see him in the Wallace Reid feature "The Roaring Road" -1919 and it's sequel "Excuse My Dust" - 1920), but Edeson, an old pro whose career started back in 1914, gives it his own flavor and contributes much to the film's enjoyment. Toby Claude, a virtual unknown who appeared in only five silent films between 1925 and 1927, turns in a top-notch performance as the sprightly "Grandma," T.M. Bancroft's wife and A.B's Svengali. Keep in mind that the "Grandma" tag is meant to be tongue in cheek. Yes, she is Jimmie's grandmother, but her personality is nothing like the proverbial grandma. We are introduced to her on one of those excercise machines with the vibrating belt that was so popular in the first half of the century. As the camera pulls back, she in a very short slip and has anything but "grandma" legs. Once dressed, she starts to come downstairs when she notices Jimmie has arrived and is standing at the bottom of the staircase. To prove that you're only as young as you feel, she sits on the stair railing and slides down into Jimmie's arms. Claude does her part to make the film enjoyable and was a perfect choice for role of the miracle worker who transforms A.B. Ever-dependable Snitz Edwards always delights when he's in a film. Although he is most often present in a film to add humor, seldom, if ever, does he resort to slapstick, but instead portrays a timid, scowl-faced second banana who gets in the way more than he helps. He is given a delightful scene in the movie when the officials of T.M. 's company begin to discuss what a disaster it would be if A.B. ever left. For some reason, they suddenly decide it is entirely possible A.B. could actually get married one day leaving the company with T.M. 's ineptitude at the helm. Since Tutweiler (Edwards) is the only bachelor in the group, he is selected to propose to A.B. - obviously the most unlikely candidate in the group! What they don't know is that they had left the intercom on, and A.B. has heard every word of this conversation - which has roused her anger intensely. So, when Tutweiler enters the room, she is ready for him. At her desk, he is barely able to utter, "A.B. - ah - ah - ah . . ." when she shouts "NO!" Although the movie is silent, her shout comes through loud and clear as the "No" on the animated title enlarges until the word explodes. The effect this has had on Tutweiler is made very clear by the next title, too, which is a simple "Thank you" written in very small letters to indicate his meek response. As for Tom Moore, he does an adequate job, but, whether intentionally or unintentionally, the script makes him appear just as inept as his grandfather and just as dependent on A.B. to keep him from losing his shirt. After all, he has an invention -- that would seem to show his initiative and intelligence, right? Well, it could, but this complicated-looking machine is an egg-beater. Sounds like something Rube Goldberg would have come up with instead; however, Moore pulls it off with dignity and seriousness - or at least as much as such silliness would allow. 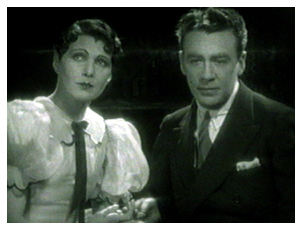 The Paul Killiam version of "The Clinging Vine" was originally released by Critic's Choice with a piano score by Philip Carli, a master silent film accompanist. This version is no longer available. The DVD release is a David Shepard production. Anything with Shepard's name on it is like having the Good Housekeeping Seal of Approval -- you know it's going to be top quality. The music score is by a relative newcomer, Frederick Hodges, who seems to have a natural talent for making a film come alive. I was privileged to see him perform at the Niles Film Festival, and it's obvious his talents will be much in demand in the years to come. 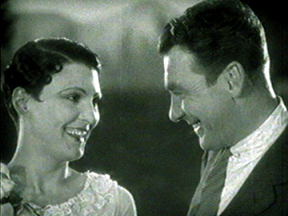 An added attraction of the DVD is the 1973 David Shepard-produced "The Age of Ballyhoo" narrated by Gloria Swanson, a nostalgic documentary about life in the 1920's. The bottom line is that "The Clinging Vine" is well-worth watching - and purchasing, but just keep in mind you're not going to see a film that's likely to make anyone's top ten list. For 71 minutes of light, escapist entertainment, it's highly recommended.